The potency of the drug as a mutagen. The susceptibility of the fetus to teratogenesis. The dose of the teratogen. The duration of teratogen exposure. The degree of transfer from maternal to fetal circulation. The global average of all live births complicated by malformation is 6% (Environmental Health Perspectives, (NIH), October 2009). The majority of these complications are due to unknown factors. The vast majority of recognized etiologies are genetic, with only 10% being attributed to environmental etiologies such as maternal health, infection, and toxicants. In general, the central nervous and skeletal systems are the most affected. Women may encounter a number of teratogens. Smoking is most likely to cause growth retardation, but has also been implicated in the prelabor rupture of the membranes, preterm labor, abruption of the placenta, spontaneous abortion, perinatal morbidity and mortality, and sudden infant death syndrome. Smoking may exert its effects through competitive binding of carbon monoxide with hemoglobin and/or through the various other components found in cigarettes that cause adverse biological effects. Alcohol use in pregnancy may result in fetal alcohol syndrome (FAS), which occurs in approximately 1% of all births. Children with FAS present with a flattened and thin upper lip, small palpebral fissures, epicanthal folds, flattened nasal bridge, and a short nose. They may also exhibit microcephaly, mental retardation, and have learning disabilities. It is not clear if there is any safe amount of alcohol consumption in pregnancy. 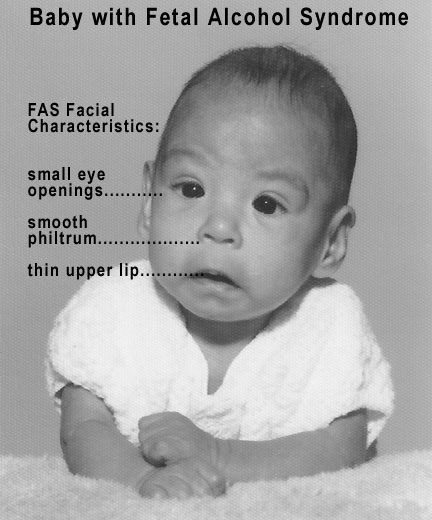 Fetal alcohol syndrome: Alcohol is a teratogen. When consumed in pregnancy, it can result in mothers giving birth to children with fetal alcohol syndrome. The facial characteristics highlighted in the photograph are small eye opening, smooth philtrum, and a thin upper lip. Cocaine generally produces growth restriction, preterm delivery, microcephaly, spontaneous abortion, placental abruption, limb anomalies, and central nervous system abnormalities. Cocaine appear to exert a number of its effects through peripheral vasoconstriction that leads to fetal hypoxia. Women with indications for warfarin therapy should either abstain from pregnancy or switch to low molecular weight heparins. Warfarin typically produces mental retardation, growth restriction, nasal hypoplasia, and opthalmic abnormalities. Angiotensin converting enzyme (ACE) inhibitors will cause fetal renal failure and oligohydramnios that lead to pulmonary hypoplasia and limb contracture. Fetal cranial bone abnormalities are also common. Isotretinoin (Accutane), used to treat acne, may cause cardiac, oral, otological, thymic, and central nervous system abnormalities. In one quarter of cases, it causes mental retardation. Thalidomide effects: A photograph of the limbs of baby born to a mother who took thalidomide while pregnant. Chemical compounds such as methyl iodide (used in pesticides) and bisphenol A (used in plastics) are suspected teratogens. Thalidomide (a sedative previously marketed in Europe to prevent morning sickness) is a classic teratogen that caused limb defects in babies born to women who took this drug in the 1960s. The effects of a teratogen on the fetus depend on several factors: the potency of the teratogen, the susceptibility of the fetus to the teratogen, the dose and duration of teratogen exposure, the degree of transfer from maternal to fetal circulation, and when during development the exposure occurs. Approximately 10% of congenital malformations are attributed to environmental factors, and 20% are due to genetic or hereditary factors. The rest have unknown causes or are due to a mix of different factors. The central nervous and skeletal systems tend to be most affected by teratogens. Cigarette components, alcohol, cocaine, warfarin, ACE inhibitors, and Accutane are all teratogens that affect fetal development. teratogen: Any agent or substance that can cause embryonic malformations or birth defects. fetal alcohol syndrome: Any of a spectrum of birth defects that result from excessive alcohol consumption by the mother during pregnancy. microcephaly: A neurological disorder in which the person affected has an abnormally small head due to a failure of brain growth.